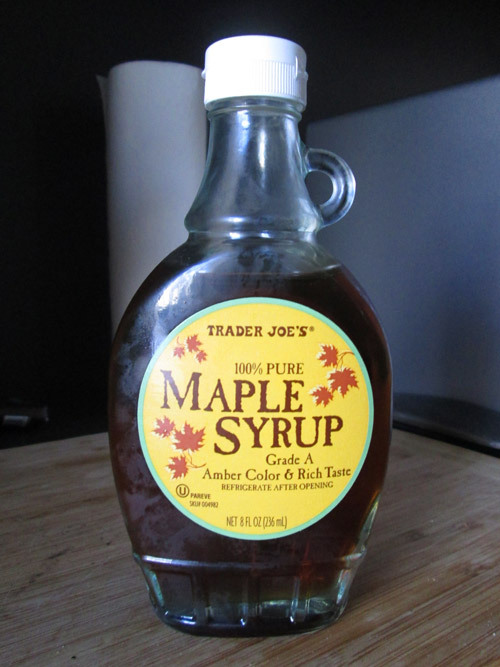 I’d always grown up eating that fake maple syrup that you buy for only a few dollars at the store, and thought it was great–right up until I went to visit my aunt and uncle in Virginia when I was 10 and my aunt gave me real maple syrup with my pancakes. That was the moment that my pancake-eating life was forever changed. I still spent quite a few years eating fake maple syrup until I eventually reached adulthood and could shell out the big bucks for the real stuff. Unfortunately, the real stuff is pretty expensive to buy regularly, so I was excited when I realized I could buy it pretty cheaply at Trader Joe’s. This syrup, like most real syrup, is pretty great! It’s got a nice sweet (but not too sweet), earthy, maple-y flavor. It’s got a nice warm flavor, and is amazing on the standard breakfast staples like pancakes, french toast, and waffles. It’s also great in oatmeal or on ice cream. But my favorite thing to put it on is coconut pancakes from TJ’s Coconut Pancake mix.